Lionel Messi became the first player to score 400 LaLiga goals on Sunday as Barcelona cruised to a 3-0 victory over Eibar at Camp Nou. 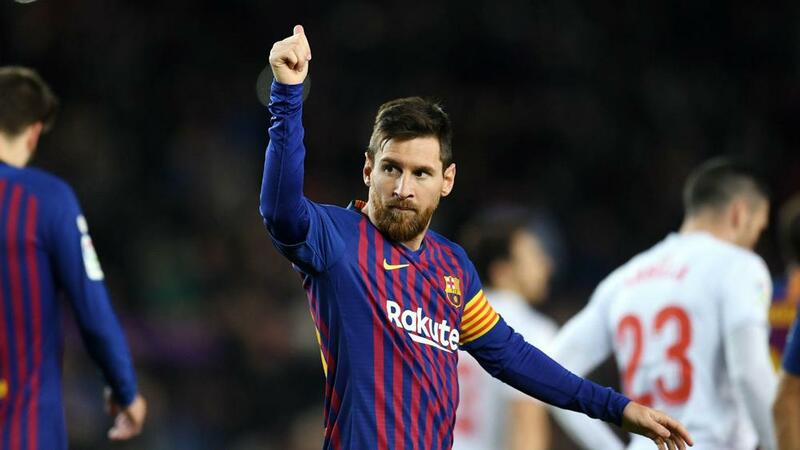 After an unusually quiet first 45 minutes, Messi burst into life after the restart and claimed his milestone goal – his 13th in eight appearances against Eibar. Luis Suarez had given Barca the lead with their only shot on target in the first half, and he doubled his tally six minutes after Messi's moment in the spotlight with a composed finish from a tight angle. That was enough to seal a sixth win in a row for Barca in the league, and a ninth successive over Eibar since their promotion to the top flight. Messi took up more of a playmaker role in the opening exchanges and created half-chances that Gerard Pique and Jordi Alba were unable to convert. Suarez showed them how it should be done in the 19th minute after a slick interchange with Philippe Coutinho opened up the Eibar defence, the Uruguay international finding the bottom corner with unerring accuracy. Despite falling behind, Eibar continued to push forward and Sergi Enrich should have done better from Ruben Pena's cross, however the striker headed wide of Marc Andre ter Stegen's goal. Coutinho felt he should have had a penalty minutes before the break but his claims were waved away despite Pena's clumsy tackle inside the area. After the lacklustre opening salvo, Barca had much more urgency to their game after the break and eight minutes into the second period Messi got his landmark goal. Having received the ball from Suarez, the five-time Ballon D'Or winner made himself some space before firing low under Asier Riesgo. Suarez then notched his 14th league goal of the campaign to extend Barcelona's advantage, before Ter Stegen needed to be alert to keep out Pablo De Blasis' close-range header. Ernesto Valverde introduced reported Manchester City target Ousmane Dembele with 18 minutes to play, but despite looking lively he was unable to stretch Barca's lead on what ultimately turned out to be a comfortable victory despite the league leaders being far from their fluent best. After seeing their advantage cut to two points by Atletico Madrid earlier on Sunday, Barca restored their five-point cushion with ease on Messi's historic night. For Eibar the defeat means they have failed to win their last six LaLiga clashes, and sit just three points above the relegation zone. While Messi will grab the headlines, Suarez deserves a lot of credit after a sublime double to continue his fine scoring run against Eibar. The Uruguay international has now scored in his last six matches against Sunday's opponents, his two goals both superbly taken. Despite his assist for Suarez's opening goal, it was a frustrating performance from Coutinho on his first league start since early December. Playing as part of Barca's front three needs quality at all times, and all too often his contribution stalled promising attacks. He was unlucky not to be awarded a first-half penalty, but some will argue he should have scored before being brought down. Barca will look to overturn a 2-1 deficit against Levante in the Copa del Rey on Thursday before returning to league action against Leganes three days later. Eibar host Espanyol on January 21.